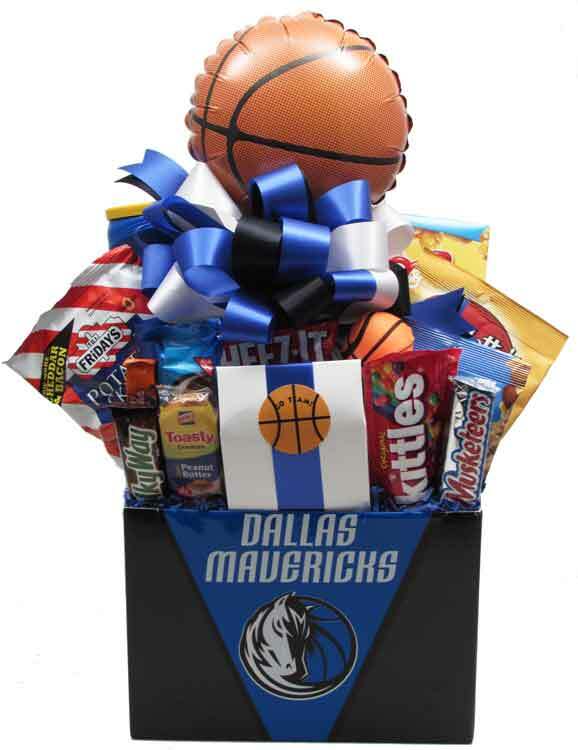 Dallas Mavs trademark Banner and lots of snacks! Potato Chips/Snacks, Theater size boxed Candy, Chocolate Bars, Snack Crackers, Cookies, Nuts and lots of Snacks! Wrapped in crisp clear cellophane, approximately 21" high x 12" wide x 6" deep. Includes a Handwritten Greeting Card. Photo is of a basket with a balloon added. Add a Basketball Balloon for $2. For shipping, it will be designed lower in the container, shrink-wrapped, and topped off with a smaller bow.